Sleep soundly in ultimate comfort all through the night in between the coziest flannel sheets ever by The Becky Cameron Collection. Made of a cotton-rich blend, these sheets are brushed to bring you super soft and comfy sheets that are machine washable for an easy clean. 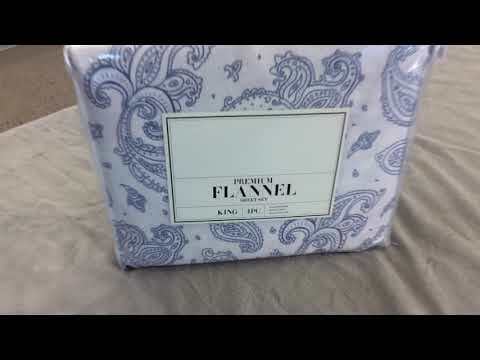 Our Flannel Sheet Set is available in a range of elegant solid colors to enhance the decor of your bedding. 1 Twin Fitted Sheet: 39" W x 75" L +14"
1 Full Fitted Sheet: 54" W x 75" L + 14"
1 Queen Fitted Sheet: 60" W x 80" L + 14"
1 King Fitted Sheet: 78" W x 80" L + 14"
1 California King Fitted Sheet: 72" W x 84" L + 14"
It's a very good ladder especially for the money! Sheets are warm & comfortable & I especially love the deep pocketed fitted sheet.